ImTOO Video Joiner is a powerful video joining and video merging software which can join or merge multiple video files into one new file as AVI joiner, MPEG joiner and H.264 joiner. This video joiner program supports a lot of video formats including AVI, MPEG, MP4, WMV, 3GP, H.264, MOV, ASF, SWF, DAT (the video format used in VCD). ImTOO Video Joiner can help you join multiple files in the same or different formats into a large one and combine multiple video files into one. It supports joining AVI, MKV, MPEG, MP4, WMV, FLV, 3GP, H.264, MOV, ASF, DAT, HD video, etc. Since ImTOO Video Joiner supports previewing the original video file, setting video size, and frame rate to get the perfect quality, it becomes the ideal tool for both new and experienced users. With high speed, high quality of output files and easy operation, you can enjoy your multimedia life. 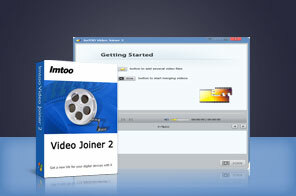 Free download ImTOO Video Joiner to joine video files perfectly. Join multiple AVI, MPEG, MP4, VOB, WMV, H.264, MOV, FLV, ASF, SWF, DAT video files as one single movie file. Join several same or different types of video files together as an H.264 joiner, AVI joiner, MPEG joiner software. Use it to combine AVI files into one file with high speed for watching without interruption. Merge multiple MPEG files into one "non-stop" file by only drag-and-drop and easily rearrange their order if needed. Supports more input and output video formats. Applies transitional effects between videos in video joining. You can add as many video files as possible to the list and freely rearrange their order if necessary. When joining video files, you can adjust bit rate, frame rate, resolution to get the best quality for your videos. The built-in player enables you to preview the video files and the output video after the process. Auto implement one of after-done actions after video joining done to release you from waiting to the end. Provide multilingual interfaces including English, German, Japanese and Chinese. Helps you split one video file into several segments with ease. Powerful video editing software comprising the functions of video splitter, video cutter and video joiner. Supports cutting videos in AVI, MPEG, WMV, MP4, VOB, DAT, 3GP, etc. formats.